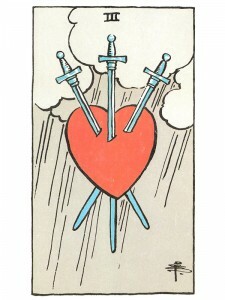 Three of Swords tells you to focus and release this conscious state of sadness. Experience your emotions fully, so that you will not get blocked by them. Sorrow is the cleansing and purifying process of grief. Allow your feelings to wash over you and release any anguish that has built up. Even in the most loving relationships there are times of conflict, hurt and separation. Try to solve your problems by expressing your feelings through some creative form. Deal with your old patterns in a new way and release the constraining energy so that healing is possible. Refuse to harbor any negative thoughts. Allow your feelings to flow freely – focus on them, experience them and then release them completely. This will allow a new creative breakthrough to enter and take it’s place. There is only one response to true sorrow – do not push the pain away from you – take it into your heart, accept it and go beyond it. Allow it to be transformed by courage and love! Acceptance and love can turn a painful experience into a joyful memory – an embracing of life. New ideas germinate from within and await their birth. Be creative and let your ideas out. Love what you have to give the world, give your spirit freedom and discover an endless source of new life through your creativity. The end results of arbitration and agreements – producing the means by which we can achieve a meditative/secure foundation. Mental resolution and clarity emerging from the influence of the lower emotions. Does not damage or limit the heart – represents the wise mind that springs from the strength of a loving, pure heart. The elemental heart is harnessed in order to use its energy for self-expression, ambition, productivity, efficiency, organization, progression, articulation, communication, literacy, wit, extroversion, expression, enthusiasm, directness, publicity, commitment, trust, decisiveness, rationality and factuality. In what ways are you suffering, feeling jealous or hurt? Lovers in the spread with swords on all sides: Severing of a close relationship. Next to Emperor: You have been hurt by criticism or unfair judgment. Do not pursue or try to change things – just start fresh and don’t be afraid. Next to World: A Karmic situation is nearly over – prepare for new events in your life – the future holds much promise. In the first position: You are a warrior for clarity of purpose and efficiency of execution. To be able to listen and learn, to talk and to teach. Determination here leads to organization and preparedness. In the second position: Great clarity, organization and communication in your physical world. Personal/business regimens are efficient, geared for quick response – good logistics and mobility when needed and necessary. In the third position: You will have the clarity and sense of purpose you need to commit yourself to timely tasks. See the organization around you in nature and realize that very same administration is in you. Move forward now with confidence to secure the mental foundation that awaits. In the fourth position: Passion for the advancement of knowledge, the progress of mind. You honor the assertiveness of your mind in all your relationships and creative affairs. You are able to express your emotions mentally as well as your ideas. The heart is in love with the mind’s ability to express itself in terms that please the heart. This is the mark of the poet/playwright and every facet of drama, advertising, publicity. Especially original and creative in mental fields. In the fifth position: Here you may be either too forward or too backward and while there may be hesitation from lack of confidence, you might well be avoiding the discipline and work required. In the sixth position: As your intellectual acumen increases and it becomes more and more evident in how you express yourself, it ripples through your relationships and creative activities. In the near future, three months to a year, this effect will be particularly strong. Enjoy your expanded personality and look forward to where it is taking you. In the seventh position: You must face how to handle your mental growth, how to extract your position and self-expression from what has influenced you thus far. Apprehension here comes from the fact that this is a cutting of the intellectual umbilical cord as you launch into the unknown of your own ideas. But just as you did not loose your mother when you separated from her at birth, neither will you be alone in this process. You do not need to wait for further information or advise. In the eighth position: The projections of your mind are the center of your actions. A time for self-expression and influence on your environment and those around you, ranging from informal conversations to taking to the stage, the page or the podium. You are putting your best foot forward. A time of organizing for maximum effectiveness. In the ninth position: There is considerable activity emotionally, a pleasant unrest in the heart to be actively immersed in the swirl of ideas in your head, to give them greater life, greater physicality. Here is the heart’s decision to be a player on the world stage. In the tenth position: Here is the wise mind springing forth from the loving, pure heart. This marks the beginning of a productive period of self-assertion, building on a solid base of discerning knowledge. You are energized and ready to make yourself seen and heard, with a mind directed to the noblest of causes. Can you tel me the right correspondence with the decans and minor arcana? Thank you very much. Thus is a Divine Revelation card. It is an indication and confirmation of a shift to higher consciousness. 3 represents the Trinity – Father (God, Creator), Son (Christ Self, Higher Self), Holy Spirit (Inner Guide, Great Comforter, Bridge), the Triad or Triangle. The presence of the 3, or triad/triangle represents presence of extreme power. Card meaning: This is not a sorrow card when seen correctly. The Trinity (3) pierces the heart (mind, soul, spirit) with absolute truth…truth has pierced the Heart. God the Father, God the Son and God the Bridge the Holy Spirit Great Comforter has entered the Heart of one’s being. The rain represents cleansing….clouds represent change, or creation in action. This card indicates a shift of one’s consciousness to a higher level. Only the Creator can authorize and reveal this to you. This is a Divine Revelation card. As with all Tarot cards, there IS no “reversal meaning” of the cards. The images were painted upright and this is the only position the cards should be read in. The reason people give a reversal meaning is because when they shuffle the deck the cards become turned around during the shuffle. Doing so they then think the card should be read or interpreted as an opposite. But that does not change the meaning of the card. All cards should always be read upright. The opposite meaning can be read into any card in the upright position because the card is not giving its meaning TO you. Rather, you are giving YOUR meaning to the card, be it correct perception or misperception of your life and your lessons. You are the only one who can give an opposite meaning to the cards as they relate to your life’s lessons. The cards do not give an opposite meaning or ANY meaning to you for that matter regardless of its position. YOU give the cards their meaning to you. The Swords represent your internal struggles to balance the mental, emotional, physical and spiritual elements in your life. The Wands represent that which brings happiness, love and joy. Together would indicate you are in the process of balancing your internal struggles with that which will result in happiness, love and joy. Interesting view…what would you say when the three of swords is next to the ten of cups? ?